The Model 440 Series System was developed to monitor tank product levels and alert pipeline personnel of a potential tank overfill. Over dedicated lines, this duplex system continuously transmits data between the Master Terminal Unit and the Remote Pipeline Unit. 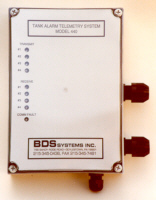 When a tank's high level monitoring device detects a high alarm or if transmission is broken, the system alerts pipeline and terminal personnel of a problem. The system supports up to four (4) normally open or normally closed contacts.